It shows two departments - Sales and Support - already created and visible. You can click on a department name to edit it. The department name is the name you would like customers to see for the department. Description is a longer piece of text describing what support tickets should be submitted to this category and will be visible to the customer when submitting a support ticket. Email is the email address from which emails for this department will be sent. If you would like the support department to be seen only by customers who have logged in, check Login required. If Login required is not checked, non-customers as well as customers will be able to submit support tickets to that department. The department can be reordered within the visible or hidden node too in the same way that it was moved from the visible to the hidden node. 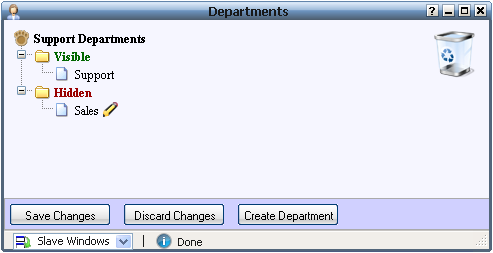 The departments can be dragged to the trash can at the top right to delete the department. After the department has been dropped on the trash can, a cross mark appears next to it to indicate that the department has been deleted but the change has not yet been saved to the server. • Save Changes button: After you have made all the changes you wish to make, click on the Save Changes button to save the changes back to the server. • Discard Changes button: Click on this button to discard the changes made and restore the departments from the server. 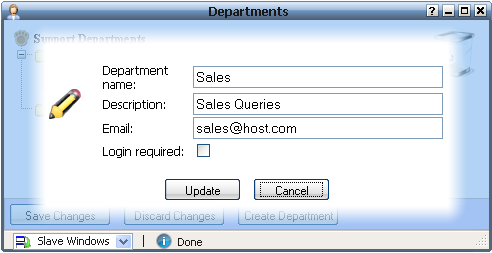 • Create Department button: Click on this button to add a new department. 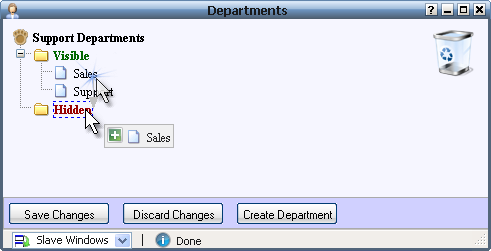 This brings up the same edit box as the one that comes up when you click on an existing department. 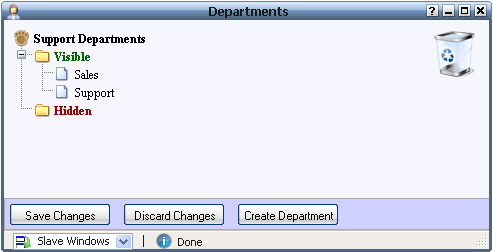 A new department icon next to a newly created department indicates it is a new department that has not yet been saved to the server. You can reorder it by dragging and dropping it where required and then clicking the Save Changes button to save it to the server.